Antonia Burrell is a woman after my own heart, a skincare therapist hellbent on helping the masses achieve their skincare and anti-ageing goals in the most natural, ethical and sustainable way possible. Don’t get me wrong, I don’t have a problem with people using botox, fillers, lasers etc for their beauty desires (far from it, in fact) but the body is SO unbelievably clever at healing itself and is too often over-looked as a starting point for maintaining a youthful appearance. Also, if you do go down the advanced aesthetics route, it is a fact (and common sense) that your results will be better and longer lasting with a good skincare regime at its foundations. 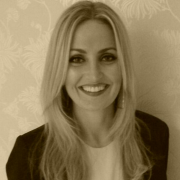 Antonia is infectiously passionate about skincare (and her face is a testament to her work, it is un-bel-ievable! I honestly thought she was nearly 20 years younger than she actually is!). She has lectured on aesthetics and aromatherapy for years, but it is now her BABTAC Accredited and Certified Face Lift Facial Massage technique that she is shouting about- and you need to hear her! Based on the facial that she herself treats her clients to, Antonia created soft suction cups to lift, contour and sculpt the face for you to use wherever and whenever you wish (I recommend everywhere and often!). Despite my enthusiasm now, I was very sceptical ahead of my appointment with Antonia- I had visions of my skin being uncomfortably stretched and pulled, and this does not constitute for a good anti-ageing regime in my opinion. 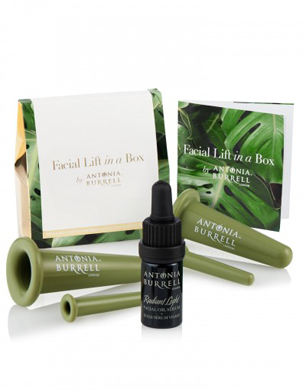 I was thankfully wrong; before the suction part of the facial, Antonia slathers the skin in her gorgeous Radiant Lift Facial Oil-Serum to create perfect slip for the cups and to nourish the increased blood flow with expertly selected healing and re-generating essential oils within the serum. Oil seems to be getting a bit of a bad rap in the beauty world at the moment, personally, I think like many products, it is a matter of preference, and of course not oils are created equally, but I certainly believe that anything that creates a ‘barrier’ to keep the good stuff in and the bad stuff out (i.e pollution) of the skin is highly beneficial to skin function. We often talk about lines and wrinkles being formed from expression lines- laughter, frowning etc but an awful lot of lines are caused from hidden muscle tension. The suction cups very easily release this tension, softening a hardened appearance- particularly worth a try if you are one of the growing number of people opting for jaw-slimming botox due to teeth clenching and grinding. Also growing in popularity with cosmetics doctors is jaw-defining filler, Antonia’s techniques for lifting and drainage on the neck and jawline can be just as effective for some (not all) people- more so for people whose bone structure is masked by excess fatty tissue. It is literally a workout for the facial muscles and it feels divine! Antonia even created mini suctions for the eye area- an area notoriously hard to treat effectively with massage. We all have a muscle circling the eye socket called the Orbicularis Oculi which, if it loses its strength i.e tautness, can have a very obvious drooping effect around the eyes, the mini suction cups are strong enough to ‘exercise’ these muscles to keep them toned (and therefore the eye area looking open and lifted) yet are gentle enough not to pull on the finer, delicate skin around the eyes. In short, these suctions cups will work harder than a personal trainer on your facial muscles! I am totally sold on these little miracle cups- defining your facial contours at the foundations and nourishing the skin via its own blood flow, and the fact that they are much more affordable than high tech treatments and there is no limit to how often you can/should use them, what’s not to love?! Huge thumbs up from me!